Ashbrook is one of the quietest and highest achievers in Australia, maintaining excellent viticulture and fastidious winemaking. All vineyard management techniques, including the application of composted mulch, are focused on the sustainable maintenance of excellent vine health. All grape picking and all vine pruning are carried out by hand. Seventeen hectares of grapes produce 150 - 170 tonnes of fruit which equates to 12,000 - 14,000 cases of wine annually. The mild maritime climate of Margaret River allows Riesling to express more floral characteristics and greater palate intensity than seen in cooler regions. Rieslings from Margaret River produced the region’s first ever trophy and gold medal. Ashbrook Rieslings are made mainly from free run juice. Grown to a variety of trellising systems and picked over several weeks to produce a wine which encompasses a range of flavours and aromas, Ashbrook Semillon is entirely unwooded. Ashbrook is arguably Australia’s premium producer of Verdelho in the unwooded, crisp, fruit driven style. Sauvignon Blanc is vinifie to an unwooded style based around ripe rather than green fruit characters. Chardonnay is 50% fermented and stored in new French barriques for 7-8 months. There is no lees stirring or malolactic fermentation, thus highlighting Margaret River’s attractive and intense primary fruit flavours and aromas which combine seamlessly with a backbone of quality oak. Margaret River consistently produces Australia’s best Chardonnays. Shiraz is grown entirely on a lyre trellis system to eliminate green characters and highlight the attractive fruit flavours of this variety. Ashbrook produces Shiraz wines of a silky, rich texture and medium to full bodied style, enhanced by 12 months in French oak and two years of bottle maturation. Margaret River is regarded as the premier region in Australia for Bordeaux blends as typified by Ashbrook’s blend of approximately 75% Cabernet Sauvignon and 25% Merlot, Cabernet Franc and Petit Verdot. Two years in French Oak and two years’ bottle maturation produce classical wines of elegance, intensity and opulence. 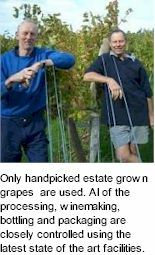 Ashbrook Estate wines are marketed throughout Australia, mostly restaurants and specialty bottle shops. 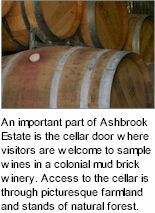 An important part of Ashbrook Estate is the cellar door where visitors are always welcome to sample the wines in the colonial style mud brick winery. Access to the cellar, which is open every day, is through picturesque farmland and stands of healthy natural forest. Ashbrook has established export markets in the United Kingdom, Germany, Singapore, Canada, Hong Kong and Japan and is developing further markets in Asia.